Fried Sweet Plantains (or Platanos Maduros) are a staple in Latin American cooking, in fact very few of these dishes are complete without them. The recipe involves using very ripe plantains which give a unique sweet flavor. This recipe shows you how to make a healthier version with less oil. Heat the olive oil in your IMUSA non-stick sauté pan over medium-high heat. Peel the plantain, then slice it on the diagonal into ½-inch slices, or tajadas. Place the plantains in the pan in an even layer and cook for 1-2 minutes on each side, or until the plantains are golden. Carefully add the water to the pan. 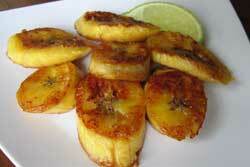 Cook until the water evaporates, and the plantains are juicy and cooked through.